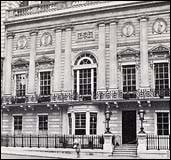 WHITE’S was the oldest and most famous and prestigious of the gentlemen’s clubs in Regency London. It started as White’s Chocolate House which was founded by Italian Francesco Bianco (White) in 1698. After the building burned, it relocated to St. James’sSt.across the street from Brooks’s. Whites is famous for its bay window which was built in 1811 and was the seat of Brummell and his friends. Other well-known members included Lord Alvanely, the Duke of Argyll, Lord Worcester, Lord Foley and Lord Sefton.